Amazon has made even more waves than usual in the last few days with the announcement that the venerable Larry Kirschbaum will be in charge of Amazon’s publishing imprints. 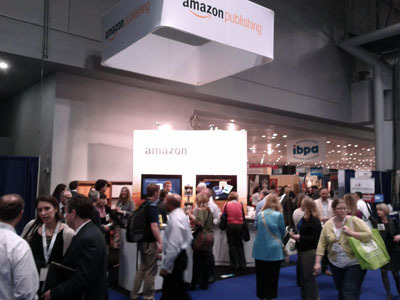 The Amazon Publishing booth on the show floor attracted plenty of visitors who wanted an advance look at what books the online retail giant would be rolling out over the coming months. The AmazonCrossing imprint publishes international literature in English translation. Books for the AmazonCrossing imprint are chosen based on “feedback of customers from amazon’s bookstores worldwide.” The sales success of The Hangman’s Daughter, the first AmazonCrossing title which sold over 100,000 copies in the first 6 months of publication, might just prove that data-driven decisions do work in publishing — if you have the data. About the book: Puerto Rican prisoner Segismundo has been imprisoned for more than one hundred years in the dungeon of liberty, hidden away by his father, the king of the United States of Banana. At the Statue of Liberty in post-9/11 New York City, Hamlet, Zarathustra and Giannina are on a quest to free Segismundo. 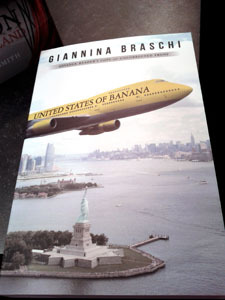 About the author: Giannina Braschi is Puerto Rico’s most influential and versatile writer of poetry, fiction, and essays. Braschi dedicates her life’s work to inspiring liberation. About the book: A mysterious enchanted stone travels through time and space from the beginning of human life through to the end of the twentieth century, connecting history’s tragic events from the perspective of the individual carrying the stone. About the author: Peter Adophsen attended the Danish Writers School and made his debut as an author with a collection of short prose entitled Short Stories. His novel Machine was published in English in 2008. 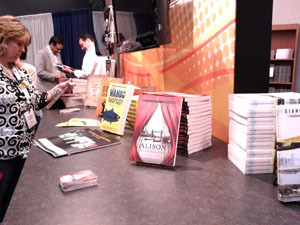 AmazonEncore also relies on data, including customer reviews and sales data, to identify books for this imprint. The goal is to highlight books and authors that have been overlooked by mainstream media and publishing. About the author: Deborah Reed resides in the Pacific Northwest, where she also writes suspense fiction under the name of Audrey Braun. About the book: When Jimmy Veeder returns home to the desert, his efforts to grant his father’s dying wish lead him deep into the Mexicali underworld, where friendship and love vie for survival amid violence and vice. About the author: Johnny Shaw owns a used bookstore and teaches writing. He lives in Portland, Oregon. Dove Season is his first novel. About the book: Take one sea-loving captain, a drug-smuggling first mate, and a novice deckhand who just happens to be an undercover DEA agent, and you have the motley crew of the Wahoo Rhapsody. About the author: Shaun Morey is the author of the bestselling Incredible Fishing Stories series and three-time winner of the Los Angeles Times novel-writing contest. About the book: A clever, quirky mystery infused with a hint of magic. At the all-female Fitzgerald’s Bureau of Investigation, Alison Temple spends her days tracking lost objects and her nights shadowing unfaithful husbands. About the author: Helen Smith is the recipient of an Arts Council of England Award. Her plays have been produced to critical acclaim in the United Kingdom. About the book: An account of an immigrant woman’s struggle to carve a better life for her family in the waning days of Word War II. Marie-Therese Brillard’s family came to Paris from Martinique in 1928. As her children enter adulthood in liberated Paris, she must reconcile her own hard-won experience about life and love with their youthful passions. About the author: After a three-decade career s a pediatric occupational therapist, Francine Thomas Howard began writing family stories. She won the Amazon Breakthrough Novel award in 2009. She lives in San Francisco.